Hard-to-find Taiwanese Teas, delivered monthly. We search the mountains of Taiwan daily to bring you the finest teas Taiwan has to offer. Monthly deliveries of teas and stories you won't find anywhere else. Taiwan is world famous for Oolong tea. Being based here gives us the unique opportunity to work directly with farmers––daily. Through these friendships, we are often treated to reserve batches, rare aged teas, award winning tea, and other teas that do not end up in shops. We created the Eco-Cha Tea Club to share the small amounts we are able to procure of these limited edition teas, with you. Hard-to-find teas. You'll get amazing tea, otherwise unavailable. Anywhere. Starting at $29 with free shipping. 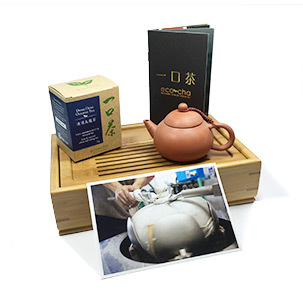 Photos, videos, and stories about how the tea was made and how it was procured. Cancel anytime. World class customer service. Choose to pay monthly or save by paying annually. Starting at only $29/month with free shipping. We search Taiwan for rare teas and send you a 75g bag on the 1st of each month. Drink amazing tea and join our growing community of tea lovers. Every month is a new adventure in what Taiwan has to offer. “ #ecochateaclub is so dangerously amazing, I kind of love it! Their tea is fantastic, can't wait to get this monthly!